The air pollution monitoring station is situated on the Alloa Ring Road, and according to Scottish Air Quality the location has been chosen as ‘worst case’, due to the busy road, pedestrian crossing and residential properties nearby. The closest trees are tucked behind a low wall in the grounds of a police station, and I am kindly allowed to hang out for several hours making my surveys of the trees – a mix of maple and cherry. ON one side of the thin piece of land is the busy ring road, on the other a railway track. As a consequence I find much of the tree branches and trunks quite black from pollution, both historic and current I imagine. 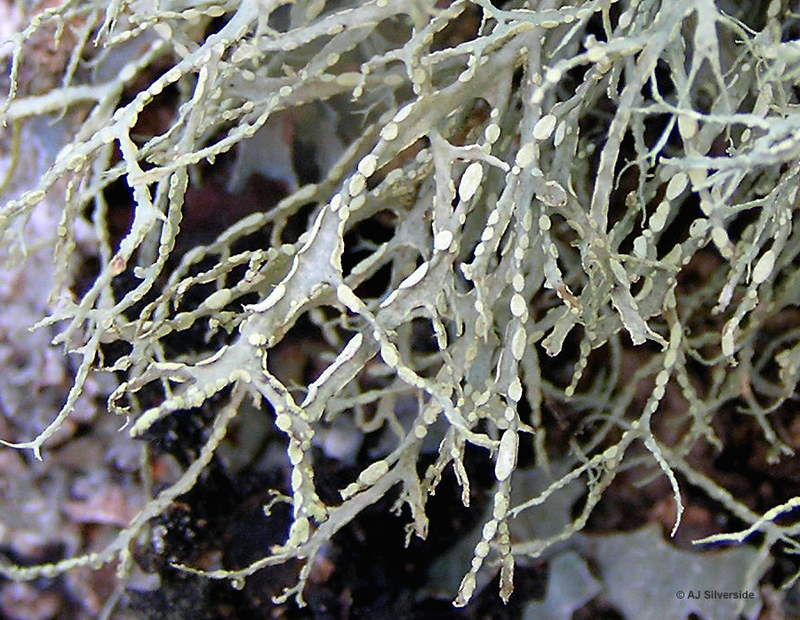 I find the classic dust & nutient-loving lichen community of Physcia, Xanthoria and Candelariella species, as well as the distinct Ramalina farinacea, which of the ‘bushy’ lichens is the most tolerant of air pollution.